Climate targets by the European Union won’t be met unless the greenhouse gas emissions from cows and sheep are cut by 75 percent, a new study from Swedish scientists has found. 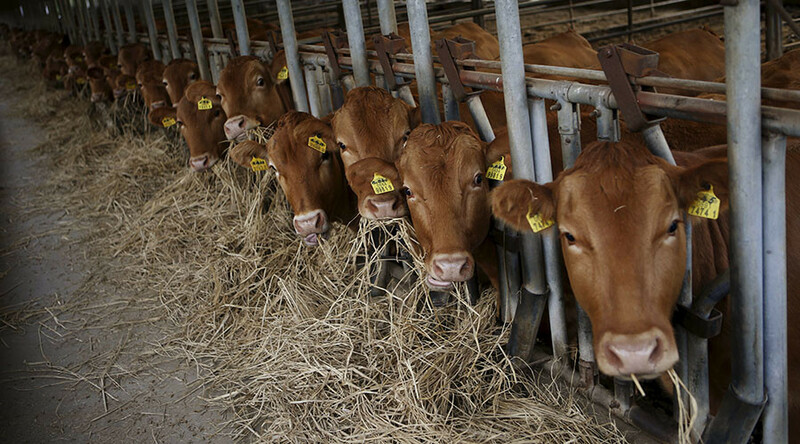 Beef and dairy production accounts for a large share of methane and nitrous oxide emissions, researchers say, and a 50 percent reduction in the consumption of 'ruminant' meat (cattle and mutton) is "unavoidable" if EU 2050 climate targets are to be met. The study titled How can the EU climate targets be met? A combined analysis of technological and demand-side changes in food and agriculture, which was drafted by a team of researchers from Chalmers University of Technology and the SP Technical Research Institute of Sweden, was published in the February edition of the Food Policy journal. These findings echo research from the Institution of Mechanical Engineers (IME) which details how the meat industry wastes large amounts of water and negatively impacts the world's supply. IME data reveals 1kg of meat requires up to 20,000 liters of water whereas the production of 1kg of wheat requires between 500 and 4,000 liters of water. The production of chocolate uses a staggering 17,196 liters of water to produce 1kg while at the lower end of the scale, 1kg of potatoes uses 287 liters of water in the production chain. Milk, which requires 255 liters of water to produce just one 250ml glass, was also targeted by the Swedes. "EU and US consumption of cheese and other dairy products is among the highest in the world and causes a climate impact equal to that of their pork and chicken consumption," says Stefan Wirsenius, one of the study’s authors. "If we were to replace some of the dairy products with vegetable products, such as oat milk, we would have a better chance of meeting our climate targets." Emissions from food and agriculture need to be cut by about 75 percent by 2050 to meet the targets and to achieve this, "substantial advances" in technology will be needed. "Far more ambitious" climate policies for agriculture will be required by governments to allow for such technological improvements. If you believe climate change is real, yet you still fly and eat meat then you might as well be a denier. "Emissions from manure storage can all but be eliminated if the facilities are covered and waste gases are flared," according to David Bryngelsson, lead author of the study. "And emissions from fertilizer production can largely be avoided by using the latest technology." Although it is stated that "dietary changes will almost certainly be necessary", it is not all bad news for meat lovers with the study demonstrating that very high consumption of non-ruminant meat (i.e., pork and poultry) could be accommodated if a dietary reduction of beef and mutton is achieved. With beef causing 200 kilos of carbon dioxide per kilo of protein, poultry and pork on the other hand produced in the range of ten to 30 kilos per kilo of protein. The European Union aims to reduce greenhouse gas emissions 20 percent by 2020, compared to 1990 levels, and hopes to limit global warming to 2 degrees Celsius by 2050.